Last night, I decided to make a cheese and onion tart for dinner. It’s a really lovely recipe and high on my list of comfort food, mainly because it includes double cream and caramelised onions which enhance it to a great degree. Ive not been sleeping very well and the resultant pityfest inspired me to spoil myself with something rich and highly calorific. While I was slicing the onions I included my finger, (sorry Richard), and then, just as I’d finished greasing the dish I was going to use, I dropped it on the floor and it smashed into pieces. (Rule No.1 – Don’t cook if you’ve gone for more than 24 hours without sleep). So I improvised by using a dish my mother gave me a few years ago – I normally use it if I’m making myself a rice pudding but it’s not too deep and it did the trick. I had just put the finished article in the oven and closed the door when I happened to look on top of the cooker and there, in a pan, were the caramelised onions waiting to go into the filling. I won’t repeat what I said next but I had to open the door again and hastily stir the onions into the mix. Anyhow, all’s well that ends well- it was gorgeous and I washed it down with a very nice glass or three of rosé. I’m not sure if that’s the correct type of wine to go with cheese and onion tart but I never claimed to be a wine buff and it was fine for me. The recipe is below, I highly recommend it. Put the olive oil and a knob of butter into a heavy pan on a medium heat. 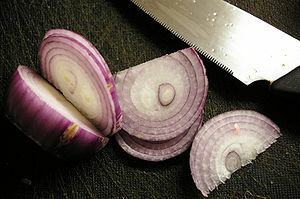 Add the sliced onions and fry until softened, stirring from time to time. After ten minutes add the sugar, reduce the heat and continue to cook them gently until the onions are soft, dark and sticky. Remove from heat and set aside. Make the pastry, wrap in clingfilm and refrigerate for 20 minutes. When the pastry has rested, roll out and line the tart tin, bake blind at Gas Mark 6 for 10 minutes then remove from the oven and set aside. Lightly beat the eggs, then mix in the cheese, caramelised onions, spring onions, cream and herbs. When the pastry has cooled, add the mixture and return to the oven. Bake for 25-30 minutes. Serve warm with a green salad or whatever you prefer.